Control your Web Hosting with a dedicated server - At Red Hot Chihuahua our aim is to provide our customers with a full range of web hosting products and management services to choose from. We offer shared web hosting, Virtual Private Servers (VPS) or dedicated servers. Whichever you select, you can be assured that will receive a reliable, secure and web hosting solution to keep your business online. Our dedicated servers are just what you need if you have a busy website, want to host multiple websites on one server, or just want a server all to yourself. Our dedicated servers come with unlimited bandwidth, and with a choice of Dual or Quad core, we have servers suitable for all of your web hosting needs. We offer Windows Server 2008 (standard or web), Linux CentOS or Windows Server 2012, and, with our automated system, your dedicated web hosting will be set up in about half an hour, whichever operating system you choose. As a dedicated server customer you will receive access to a large range of backup services too, from just £13.20 a month for 10GB to £66.00 a month for 100GB. When you sign up for a dedicated server with Red Hot Chihuahua, you receive a free 12-month registration of a .com or .co.uk domain name. You can also upgrade your dedicated server by adding cPanel for just £27 per month - the number one control panel for web hosting administration. 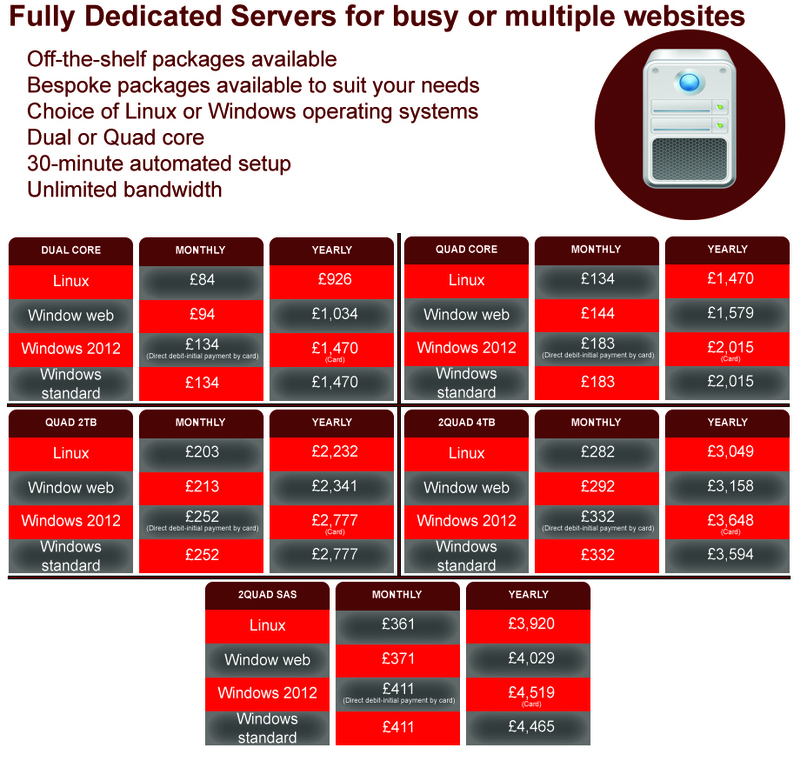 Whatever your Web Hosting and dedicated server needs, Red Hot Chihuahua offers a flexible range of web hosting solutions to support your online presence. Just select a domain name to get going, or contact us for personal support.